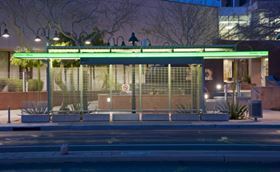 AOC's Chroma-Tek pigment dispersion ensures the precise green shade for composite bus shelter grids. A study by the Arizona State University found that the heat inside a traditional metal bus shelter can reach over 140°F (60°C). A solution created by architect Jeff Jarvis of transportation infrastructure provider TranSystems Corporation, Kansas City, Missouri, USA, integrates a composite grid structure with landscaped trees to create a microclimate system that casts shade on waiting passengers. The system is designed to ensure that at least 6 of the 10 available seats in the shelter will be in shade at any given time of the day. The shelter structure is based on composite because composite does not conduct heat the way metals do. The performance of the composite design in the City of Mesa, Arizona, USA, has been so successful that the Valley Metro Regional Public Transit Authority bus company will also use it for the next series of shelters built in Chandler, Mesa and Gilbert. The bus shelter design calls for composite grating panels to be used for vertical walls and the roof to take advantage of the grating’s inherent grid pattern. The panels for the shelters were manufactured by Fibergrate Composite Structures Inc, a Dallas, Texas, based supplier of FRP composite grating and structural shapes. Fibergrate’s manufacturing process automatically places continuous fibreglass roving into the channels of a special open mould. The channels are between raised partitions that give the mould the look of an inverted waffle iron. The fibres in the mould are impregnated with resin and cured to form moulded panels that are corrosion resistant and have a high strength-to-weight ratio. In addition to standard tests, Jarvis subjected demonstration panels to 'real world' situations. For example, Fibergrate samples successfully withstood full swings of a baseball bat and torching from a high-powered portable lighter. Jarvis also says that the surface of the Fibergrate grating panel is not affected by standard anti-graffiti cleaning materials and equipment. The colour of the composite was optimised in a cooperative effort between Fibergrate and AOC, supplier of Chroma-Tek® colorants for composites. To achieve the precise colour that works best, Fibergrate asked AOC to provide three different custom-colour cast resin samples made with Chroma-Tek pigment dispersions. Defense, shipbuilding, and engineering conglomerate company Damen Shipyards has recently demonstrated its new composite 2407 Water Bus.